Is it okay to attend an all day conference called Teaching 21C: the big issues facing the profession today and not, in the whole day, hear from a practising teacher? I understand that you don’t come to a conference to hear only from teachers . You can get that around the photocopier or at the water cooler and there has been the growth of more hand-on options like TeachMeets where practitioners can share practice, not to mention the networks you can develop in platforms like Twitter. You go to hear from experts, and learn. But I did feel, at the end of a long day that felt at times a brow-beating (if not belittling) of the teachers who constituted most of the audience, that it wouldn’t have been hard to include some teachers who might be able to contribute to the discussion, if only to respond to some of the provocations. Don’t get me wrong; there were some good moments, particularly the session on evidence-based practice that seemed firmly grounded in, and linked to, how real schools work. Suzie Riddell (SVA) took us through a toolkit for schools called Evidence of Learning, which seeks to help schools make good choices about what kinds of change you might choose to implement in terms of $$ costs, evidence for a positive effect on learning, including links to more reading and the scale of that effect; a bit like Hattie’s work put to good use. But they were the highlights. Geoff Masters (ACER) was one of the keynotes and one of the most disappointing. He showed a series of un-labelled slides, designed to highlight falling standards in Australian learning outcomes (PISA, naturally). In some of the slides (shown below) high results were good, others when they were bad. It was hard to follow; they had no titles, there were no scales. Masters talked about ‘Five Challenges’ facing Australian education: declining standards, growing disparities between schools, students falling year level expectations, students starting school at risk of being locked into long-term low achievement and (irony alert) teaching is becoming less attractive as a career option for able school leavers. Masters didn’t take questions. And not a teacher got to speak. It was all summed up in final plenary panel of grey-haired white men, a dynamic that even they felt a little embarrassed by. 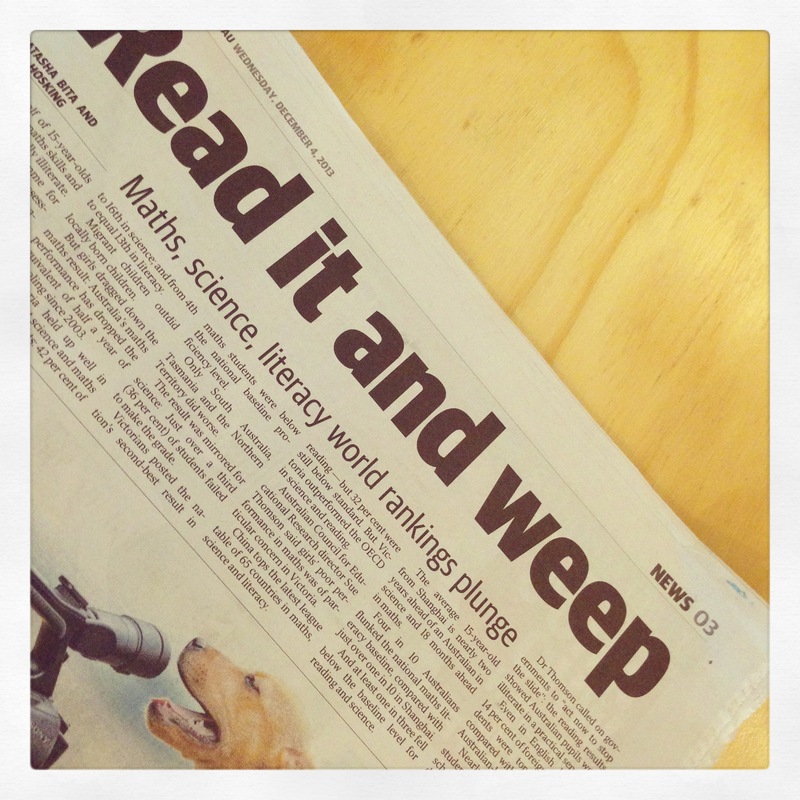 Or at least that’s how Tom Alegounarias, a board member on the Australian Curriculum Assessment and Reporting Authority and president of the NSW Board of Studies, sees it in a ‘hard-hitting’ (read self-aggrandizing) speech at a conference in Sydney somewhere yesterday as reported in the Murdoch press. No doubt over neatly wrapped mints, glasses of chilled water and an audience who have been nowhere near a classroom in years Mr Algeounarias said that teachers had been dragged reluctantly to the discussion on data. “The profession has generally been dragged reluctantly to the part of the educational debate that focuses on identifiable and measurable attainment. “We’re reluctant to be associated too closely with any data that purports to sum up a level of achievement or pattern of attainment, no matter how popular it appears to be to outsiders. Mr Alegounarias said teachers had to discard their “phobia” of data and instead seize the initiative and develop better and more valid ways of measuring and comparing student performance. This reluctance to embrace the use of student data was hampering efforts to improve education and overcome the effects of social disadvantage, he said. Well, perhaps. But that might be because of the paucity of quality data, the reliance on standardised testing (and standarised curriculum Mr ACARA) and the way the data is mis-used by the (Murdorch) press to create the quasi-league tables and the simplicity that comes out of all that. I attended an ACER Conference a while ago on ‘Using Data to Support Learning’ and got a lot out of it. Trouble is, the data simplifies what is in fact very complex and leads to blanket simplified approaches that improve testing scores but have little connection with real learning. Earlier this year, in my Texas round-up of the ASCD Conference (doesn’t Texas and Round-up sit nicely together in that sentence! 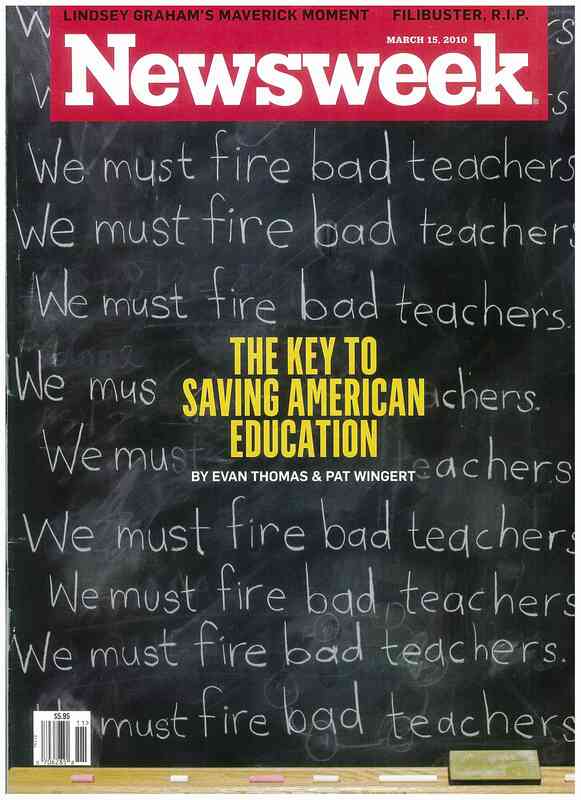 )I attended in March, I posted the ominous ‘sack teachers’ Newsweek cover, which I thought epitomised something of the disregard lots of Americans have for the profession. 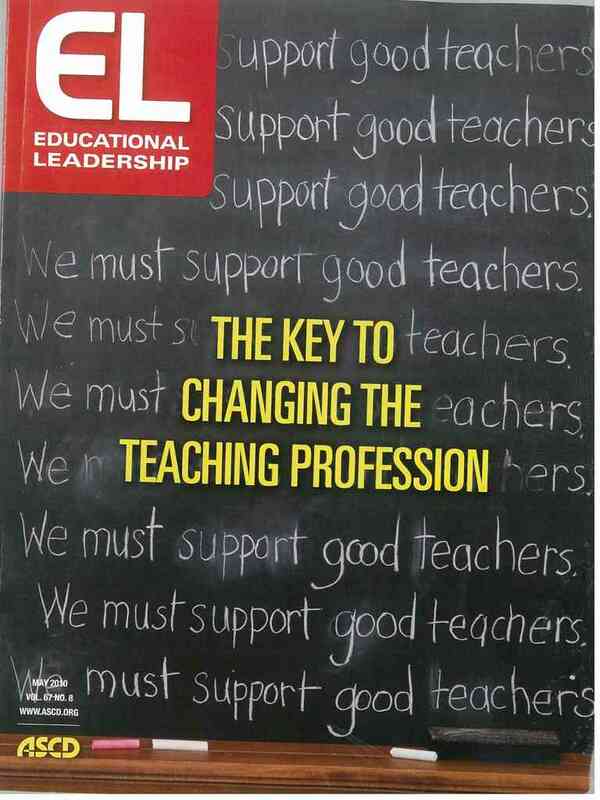 So, good on ASCD and the latest (May 2010) issue of Educational Leadership, who have turned the Newsweek cover on its head (below) ASCD do good things; where’s the Australian equivalent? And don’t say ACER! Didn’t they invent NAPLAN? It didn’t work in the USA, it didn’t work in the UK, but let’s try it anyway. The Rudd government’s plan to ‘name and shame’ under-performing schools, principals and teachers is simplistic, populist stuff. 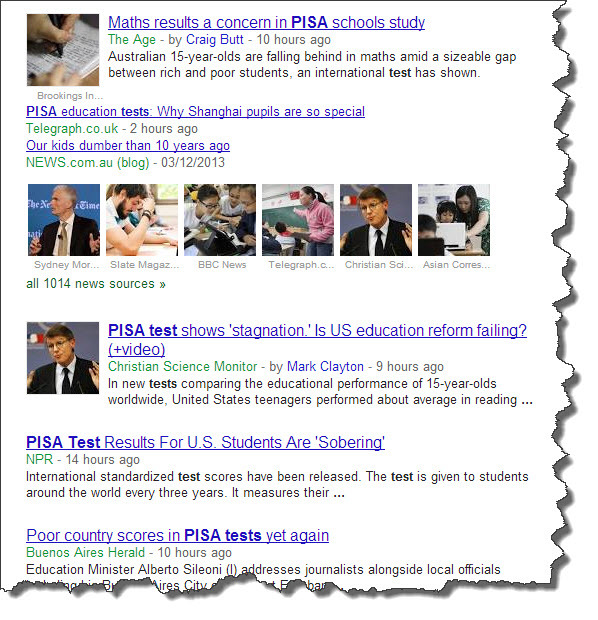 Stuff that wont improve student learning. KEVIN Rudd will demand states take tough action against failing schools, sacking principals and teachers and even closing sub-standard schools, as a condition of a multi-billion-dollar education fund to ensure all students have a good education. The Prime Minister will seek agreement from the states to reveal the relative performance of their schools from next year, with individual school reports available to parents within three years that detail their child’s results as well as the school’s performance against a group of comparable schools. Mr Rudd unveiled the latest stage in his education revolution at a speech to the National Press Club in Canberra yesterday, including extra funding to reward excellent teachers and attract the best and brightest graduates into teaching. All the journalists, academics and politicians must be back from their holidays because the media is abuzz this week with all kinds of what should be done to ‘fix’ schools and teachers in the process. Meanwhile, economist Andrew Leigh argues in today’s Education Age that the government should persist with an investigation of performance based pay for teachers (not academics) which is what I thought the other party were in favour of? Leigh is concerned with what he calls the ‘decline in the academic aptitude of Australian teachers’ based on the average percentile rank of those entering education courses. Leigh is a little vague about what might constitute high performance but argues for an opt-in scheme to be trialled. Should remuneration be a factor in becoming a teacher? Hardly. And money does not make an exemplary teacher either. So what does? The children in front of a teacher are not concerned how much or how little Mr of Ms earns. What they want is to be taken seriously as individuals, and to be excited and challenged by ideas. Learning new stuff is a powerful intoxicant. If teachers forget this, or are distracted by money issues, they may as well resign. All presumably within the bounds of the national curriculum of course. Oh, and don’t think the Herald-Sun has ignored the burning issues of the day either. It’s cutting edge front page story today by Carly Crawford is called Criminal Classes in Victorian Schools (love the alliteration) and warns its readers that the Victorian Institute of Teaching has quietly allowed 400 teachers who have been convicted of serious crimes in the past to keep on teaching. So, teachers should get paid more, not care about pay, improve basic literacy and numeracy but don’t neglect the bright kids, think differently and originally but be prepared to teach the same curriculum as everywhere else in this wide brown land. And, don’t forget there’s a lot of ‘criminal classes’ out there. I wonder what week two will bring? You’ve gotta hand it to the Victorian Institute of Teaching, the compulsory union you’ve got when you haven’t got a compulsory union, although unions represent their constituents, not over-regulate them. When it was first established I was hopeful it would represent the professional voice of teachers in Victoria: advocate for teachers, put the teacher perspective in the education debate, advice and support the profession, perhaps a bit like the AMA? That hasn’t been what’s eventuated. What’s eventuated is an institute that regulates the profession, that administers, that supervises, that over-supervises, that licenses and regulates and charges fees. An annual fee, in fact, to maintain your teaching licence. Maybe I’m over-sensitive, but look at the language in this letter (below) Victorian teachers received this week: ‘It is important that only you complete this form’, ‘follow the instructions on the form’, ‘the Institute will not able to process an incomplete application form’, ‘registration cannot be renewed…’ etc. Does it sound like the VIT are talking to their constituents? It was accompanied by two densely printed pages of notes mainly related to what teachers need to do to remain … teachers. And of education? Not a whisper.